A few days ago, I came across "Famous Writers' Small Writing Sheds and Off-the-Grid Huts" and I sat, dreamy-eyed, wishing I had something like Roald Dahl's shed or Virginia Woolf's little bitty house. Now, I will grant you that my coveting may have had something to do with Dahl and Woolf and all those other authors. Maybe if I had a little writing shed, I’d be an amazing writer just like them. But there's also this: I love small spaces with a view of nature. When I was a little girl, I would squish through a bank of camellias that hugged a wall of our house in Savannah. There must have been a half-dozen six to eight feet tall, lush camellias, and once behind them, my 9-year-old self could walk around and under, hiding out in several leaf-canopied rooms. That was my most favorite, not to mention delightfully cool, spot. But sometimes, I’d camp out on the tin roof of a shed in my backyard (where the washer and dryer lived) and sit beneath budding branches, watching the world go by below. When I looked at those writers’ sheds, I remembered my childhood spaces, and I wanted that delicious feeling again for my writer's room. As it happens, I’m lucky enough to have a small office all to myself. My desk sits in the space between the two windows that overlook my front yard. 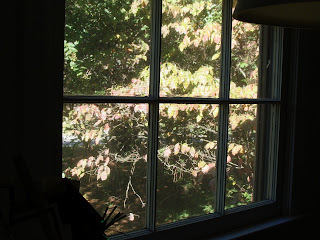 I love looking out my windows and writing. But sheer curtains somewhat obscure the view. So I took them down. Just climbed up on my office chair and pulled those curtains right off the rods. Now I can look out and see the birds dashing through the trees on either side of me. I can watch the squirrels playing tag under my windows. Seriously, I’m sighing as I’m writing this post. But just so you don’t think I’m a bit of an exhibitionist, I should mention that I have several tall crepe myrtles in my front yard and a pink dogwood as well. And of course, a couple pines. They do a fine job of blocking the view from the street while providing me with a lovely, green (starting to turn golden-red) vista. Maybe it’s my imagination, but it feels as if my thoughts are flying out of my brain and filling my pages. Or maybe I’m just basking in childhood revisited. I don’t want to overanalyze it; I just want to enjoy my small writing room with a view before winter winds spoil my fun (and word counts). What a wonderful post, Cathy. Yes, we all need different things as writers but to wait until we have a perrrrfect writing space--that's just crazy. Madeline, give it a try! Of course, if you're writing really scary stuff, then wait till late at night. A dark window, staring back at you? Very creepy-inducing. Cathy - great post! I, too, took my curtains down so I could see more outside. My desk in in the corner of the kitchen where there are two window literally in the corner. I love it! It looks out into what my sweetie calls my mediation garden, because I can sit inside and stare out the window, gathering inspiration or simply clearing my head so I can write. BTW - I saw the site you are taking about a while back and fell in love, too! Some of the places are just, as SPARK would say, succulent! I was scanning through the Muffin without reading author names. Stopped here and thought midway, This is Cathy Hall's voice. By golly, it was you! I want a playhouse too...to write in of course.